So here’s the question. What makes you want to buy a card? Obviously, if you are a player or team collector, the player or team featured on the card will be significant factors in guiding your decision. Giants’ fans like myself generally don’t have too much interest in buying cards of Dodgers (unless it’s an old Steve Garvey card to stick on the dartboard). But those factors aside, I would argue that the overriding factor, at both a conscious and subconscious level, is the design of the card. Simply put, does the damn thing look good? One of the more noticeable trends over the past decade has been the rise of retro-themed sets. While more than a few collectors deride retro sets, there’s a reason for their popularity. Quite simply, the older designs which these cards are based upon are generally far superior from a purely graphical standpoint than most new designs. Topps Heritage didn’t just take the hobby by storm by accident. It has been successful because many of the early Topps designs belong in the graphical design Hall of Fame. 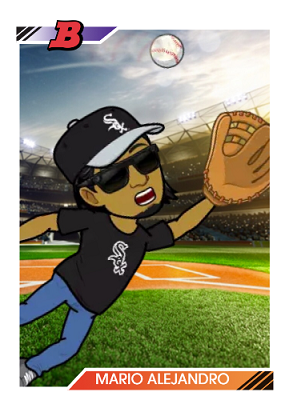 Even today, sixty-five years later, the 1954, 1955, and 1956 Topps baseball sets are probably the three best-looking baseball sets ever created, and why the 1955 Topps All-American, 1955 Bowman, and 1956 Topps football sets are among the most popular football sets of all time. And as you might guess from the title of this post, these are also what I consider to be the five principles of good card design. Now before you say to yourself “oh, he’s full of it”, ask yourself this. Which do you like better….1955 Topps or 1955 Bowman? 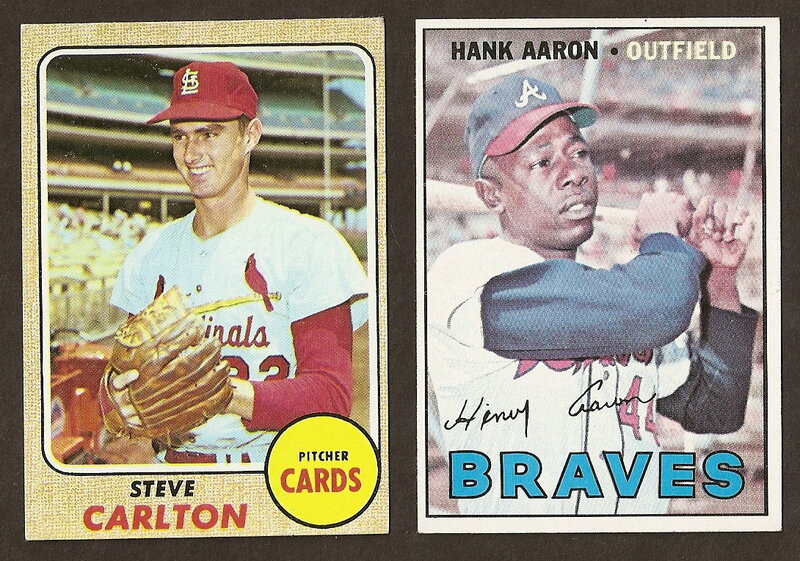 1967 Topps or 1968 Topps? Why do you think that 1975 Topps is by far the most popular Topps set of the 70’s? Even looking more recently, why do you think that 2009 Topps was so much more popular than 2009 Upper Deck? I’ll bet that every time, you chose the design that best adheres to the five principles. Now, while principles #1, #2, #4, and #5 are pretty straightforward, some of you may take issue with principle #3. Do cards really need to have borders to look nice? Well, my response would be to wonder why it is that people frame photographs. The answer is that for some unknown reason, our visual cortex likes the idea of having a defined boundary. This is why we think most images look nicer framed. That said, full-bleed designs can look good, but generally only under one condition, namely when there is a large amount of contrast between the player image and the background, such as with 1954-55 Topps Hockey, the first series of 1969 Topps football, 1993 Fleer GameDay football and the 1993 Score Franchise inserts. One area where this is been most apparent is in the design of Upper Deck cards. Up until 1993, Upper Deck cards featured both borders and gorgeous photography. However, 1993 was the year in which Richard McWilliam forced out the original founders of Upper Deck, the result of which was an immediate switch to full-bleed designs and an increased use of foil (which should never be used for lettering unless against a high-contrast background like in 2009 Topps), the result of which has been fifteen years worth of cluttered and garish designs with difficult to read lettering (note to Upper Deck, as anybody who has dabbled in photography or graphic design can tell you, the key to good design/composition is simplicity, not clutter). Now although I feel that the industry as a whole is struggling mightily, one aspect that I find promising is the renewed emphasis on good design by collectors. Gellman, over at Sports Cards Uncensored, routinely slams poorly designed relic and autograph cards, and many other bloggers have become increasingly critical of lackluster designs such as 2009 Goudey (whose artwork was a pale shadow of the 2008 version), or Topps’ 2010 National Chicle. Or think of it another way, consider which sets and cards have remained the most popular over the years? It’s the well-designed ones which people still enjoy looking at. 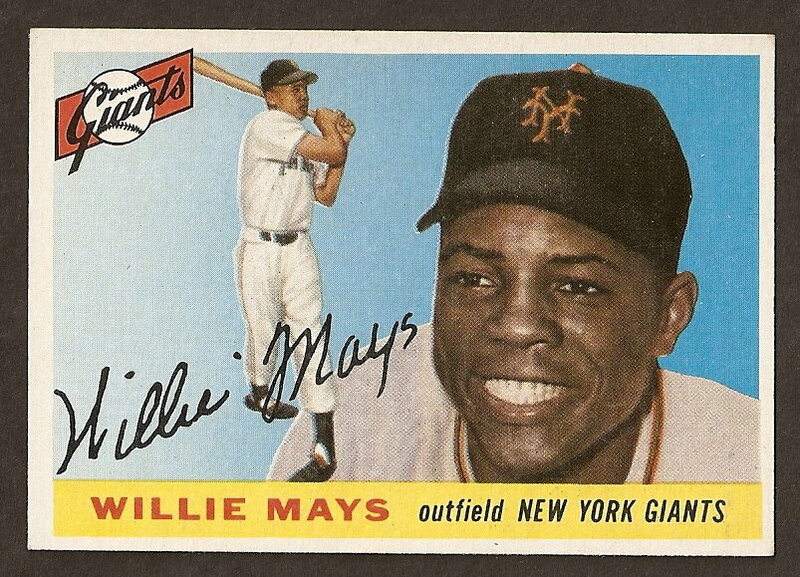 There aren’t too many people with a 1970 Topps card on their mantelpiece, but I bet that there are more than a few with a nice 1956 Topps sitting there. Upper Deck: Where Do We Go From Here? Design is everything, but often content trumps design. I’m a person who’d rather have great design over hit content, you know? More often we see products sell like crazy even though they look horrible (Triple Threads, 09 NT, SAGE, Platinum, Black, Tribute, etc) because they have game-used and autographs people desire (or bang for their buck, as it were – where would the industry be if we turned back the clock to ZERO game-used and super RARE autographs?). Heck, I hate MOST high end card designs, and it amazes me that people will through down the money for Exquisite, you know? Then again, I’m a guy who loves sets like ’84 Ralston Purina, so… My opinion is likely worthless. This is exactly what I have been saying on my blog. Good design makes a card set memorable. If you go with minimal design or no design, then it’s just a photo, and the set is difficult to recall because all the sets look the same. Putting effort into the entire package — design and photo — to create visual appeal will make a lasting, popular, and if you’re lucky, iconic set. As for Goudey, don’t forget the original Goudey series. The UD issues are a pale reflections of those amazing cards. Could not agree more with your post….. Simple designs will consistently beat newer looking designs. The frames are what made Masterpieces what is was, and now almost every collector out there wishes it was still being released. Personally, I’ve always been drawn to sets with some sort of border, so I’m down with element #3. I think most of us like our cards to look like “art” and a frame helps achieve this. Masterpieces is the one issue that took the next step and combined classic events onto canvas and then added on top a real paper frame. I think Masterpieces could be a money maker if Upper Deck stuck to classic events (how about perfect game pitchers as a nice subset), kept the canvas and paper framing, and had some of those classic events signed by the participant (in lieu of inserts based on the standard relic. Wouldn’t you rather have a Mike Witt signed 1984 perfect game card than a jersey purportedly (I use that term given UD’s admitted counterfeiting escapade) worn by Bill Hall? Very well written post, couldn’t agree more with you on most of your points. My only exception is with ’55 Bowman baseball. 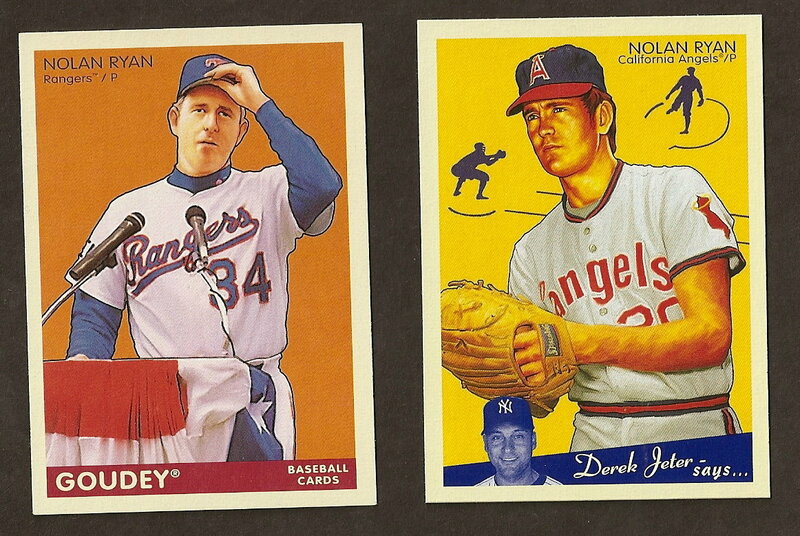 The Bowman set had the potential to be a great, it was just poorly executed. Generally, the photography wasn’t great (colors were off and the compositions weren’t very exciting), but the design was really incredible. I mean, players inside of a wood-grained TV set? The design was so far out of left field (no pun intended), and perhaps so ahead of its time, that even today it doesn’t get the sort of credit it deserves. I guess my point is, sure, Topps had a good design that was well executed, but credit has to go to Bowman, too, for what could be the most creative card design of the 1950s. Ha! Everyone likes to think themselves to be a designer.